The Vanderkloof Dam (originally P K le Roux Dam) forms part of the Orange River Project, the largest engineering and water conservation project ever attempted in South Africa. ESCOM’s Vanderkloof Power Station is situated underground on the left bank (Cape side) of the Vanderkloof Dam. 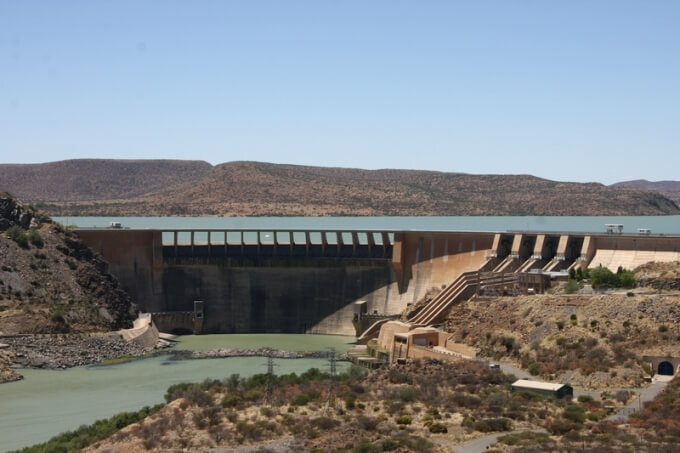 It is the second hydro-power station made possible by the Orange River Project. The Vanderkloof Dam plays an important role in providing water for irrigation to more than 100 000 hectares of productive agricultural land. The dam is also perfect for angling and water-related sports including sailing, skiing and windsurfing. Building the dam gave birth to the beautiful town Vanderkloof, popular with holidaymakers and travellers. Rolfontein Nature reserve borders the Vanderkloof dam. Vanderkloof Dam (previously the PK le Roux Dam) is situated 130km downstream of Gariep dam on the Orange River. It forms the second largest storage reservoir in South Africa with a capacity of over 3 200 million m3. 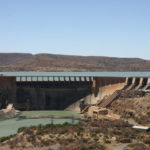 The dam forms an integral component of the Orange River Project (together with Gariep Dam) and supplies water to the Riet River catchment as well as to the various users along the remaining 1 400 km of the Orange River. The Vanderkloof Dam is currently the highest dam in South Africa with a wall height of 107m and a crest length of 765m. Similar to Gariep Dam, it is a composite gravity arch dam containing 1.1 million m3 of concrete and has a central arch which transitions into a gravity flank on the left bank. Vanderkloof Dam was originally scheduled to commence at the same time as the Gariep Dam, but in October 1967, construction was postponed in accordance with government measures to curb inflation in the national economy. During 1969, the Cabinet decided to proceed with the project and in 1970 tenders were requested for a second time. The tender prices received, were much higher than expected with the result that Cabinet decided that the Department of Water Affairs should construct the dam using their own construction staff and equipment. The Vanderkloof Dam was designed by a consortium of local and overseas consultants and constructed by the Department of Water Affairs and Forestry. Construction started in April 1971 and the dam was finally commissioned in September 1977. Four gates installed in the wall can discharge up to 8 500 m3/s in total through the flood sluices which are positioned on the left flank of the dam. Water released from the Gariep Dam flows into Vanderkloof Dam where it is either transferred through the Orange/Riet Canal to the Riet River basin or released downstream through two hydro-power generators. The generators can each produce 120 MW of electricity at a discharge of approximately 200 m3/s. The hydro-power plant can, therefore, provide up to 240 MW of electricity at a flow rate of 400 m3/s. It was originally envisaged that the right bank canal would extend to the Brak River Valley in the Prieska-Britstown area as well as the Carnarvon-Leegte, the Beervlei area, the Sak River Valley and the Koa River Valley. Due to economic factors concerning the financial viability of the developments required, however, it was decided not to proceed with the extensions of the right bank canal which now stops near Hopetown. Similarly, it was originally intended to construct a left bank canal from the dam to Hopetown in order to supply irrigation along the left bank of the Orange River. This canal was not constructed and all irrigation along the left bank between Vanderkloof Dam and Hopetown is supplied directly from the river using pumps. The 6 200ha Rolfontein Nature Reserve is located on the northwestern shore of the dam and is home to eland, gemsbok, red hartebeest, Burchell’s zebra, white rhinoceros, kudu, springbok, grey duiker, bat-eared fox, baboon, vervet monkey, aardvark and aardwolf. Dam tours can be undertaken, giving you insight into the history and workings of the dam and the hydroelectric power station (one of only two in the country) that is built within the dam wall can also be visited by appointment. The Vanderkloof Dam resort holds a number of annual events, including the Water Festival, Biker Rally, and the SASRU Intervarsity Regatta. Sixteen kilometres north of Petrusville and bordering on the Vanderkloof dam the Rolfontein Nature reserve is situated in the upper Karoo. The terrain is made up of Karoo plains dotted with dolerite buttes (known as koppies), as well as mountains with wooded kloofs. The white rhino, Burchell’s zebra, brown hyena, springbuck, gemsbok and other antelope can be found in this reserve, as well as the more elusive aardvark and aardwolf. The Piet Barbet hiking trail is a short 4km meander through the park, but hikers are welcome to explore further, as long as you make arrangements with the park management in advance. Visitors can picnic in the reserve and overnight accommodation is available in tented camps and there are two overnight huts for hikers. More information available on registered dams of South Africa available HERE.